Today I made Gajar Ka halwa, especially for my husband. He has a sweet tooth and likes every sweet dish and dessert that he can lay his hands on. Recipe: Making gajar ka halwa or gajarpak is very easy. 2. Boil them till they soften. If you are making them in cooker then it won't take more than a whistle to get them softened. 3. Mix sugar to taste and now remove the lid from the cooker or pan and let the water evaporate by continuously stirring the mashed carrots. 4. When the water has dried, add milk and again stir for some time. 5. The carrot, milk mixture will thicken and your gajar ka halwa is ready. 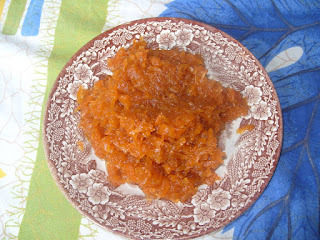 I haven't given any quantity for this recipe because I don't know my self how much carrots or milk are needed to make a particular amount of halwa. I always prepare dishes on guess. My measurements are never same for a single dish. You got me Drooling, seriously! My list of sweet-delicious-desirables is a li'l big and Gazar ka Halwa is something which is in the top section of my "sweet-list". I suddenly miss my home now! An ultimately delicious post, keep it up!